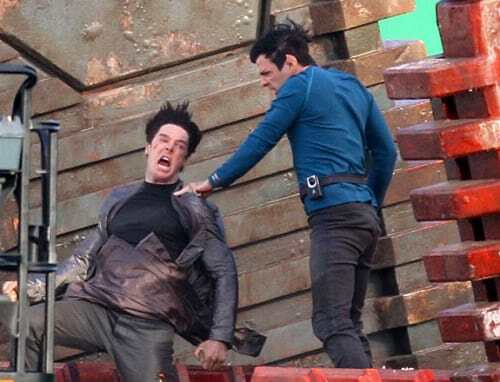 Star Trek 2: First Set Photos! The first photos from the set of J.J. Abrams’ Star Trek 2 have arrived! 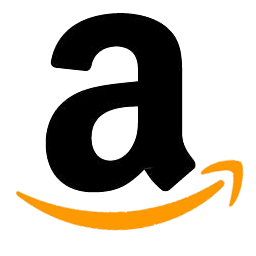 Until now, the filming of the sequel to the highly successful Star Trek reboot has been under a shroud of secrecy. The photos were posted on MTV, and the first features Zachary Quinto’s Spock in action. 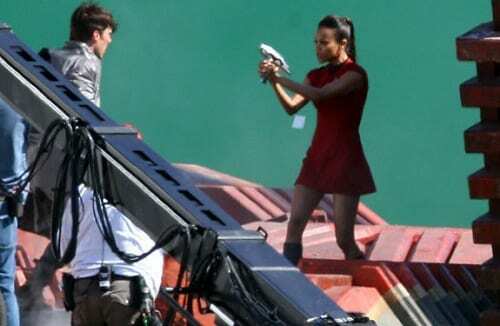 The second set photo has Zoe Saldana as Uhura wielding her weapon against villain Benedict Cumberbatch (also seen in the above photo). Of course, these pics don’t tell us a thing about the film itself. But, we’ll take any nuggets of anything from Star Trek 2! 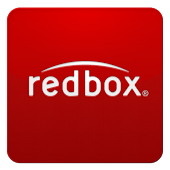 The film arrives May 17, 2013.